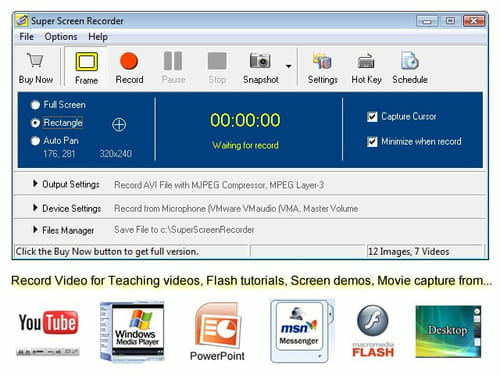 Super Screen Recorder is a program that can record videos in a matter of minutes. It supports a wide range of formats for the output. Creation: this utility is especially designed to create interactive presentations and tutorials. It can produce a high quality video and offers the ability to edit and enhance them. The output will be saved in AVI or WMV. Capture mode: we have the choice between full-screen capture and a window capture of a Web page or a predefined area on the desktop. The user can select the part of the screen he wants to capture. Enhancement: Super Screen Recorder enables to adjust some parameters to enhance the output. For example, colour level, frame rate, size, and the image resolution. It is even possible to add logos, text and custom watermark to protect the user's work. Configurable: another option integrated to Super Screen Recorder enables to schedule recording by indicating the start capture and end capture time. Thanks to this, the utility will automatically start recording at these times. It can be used as a file manager. It can record sound from a microphone. The work can be shared on YouTube, Facebook or Twitter. Latest update on November 21, 2016 at 05:41 PM.